Skegness Railway Station ... your views are wanted on the future of rail services in Lincolnshire. From faster journeys to more comfortable carriages, your views are wanted on how to improve a host of train services in Lincolnshire. The Department for Transport is re-letting the East Midlands rail franchise in 2018 and has asked Lincolnshire County Council what improvements the authority would like to see. 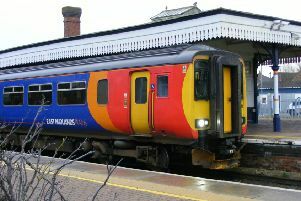 The franchise includes Skegness to Nottingham via Grantham and Peterborough to Doncaster services via Sleaford and Lincoln. Other services are Lincoln to Leicester, Norwich to Liverpool, and Grimsby/Cleethorpes to Newark North Gate. Coun Richard Davies, executive member for transport at Lincolnshire County Council, said: “We have a great opportunity to put forward some ideas which could significantly improve rail provision in our county. “We want to hear what improvements would encourage local residents to hop on a train, so please let us know what you’d like to see. “More regular trains with extra capacity, improved connections, better Sunday services, faster journeys and more comfortable carriages with Wi-Fi are just some of our thoughts. lincolnshire.gov.uk or call 01522 782070 before the end of February. For more information about rail services in Lincolnshire, log-on to www.lincolnshire.gov.uk/transport.